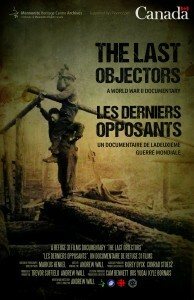 The film The Last Objectors produced by Refuge 31 Films is a 45 minute documentary written and directed by Andrew Wall. This highlights the lives of those in Canada who chose to be conscientious objectors based upon Christian beliefs during the Second World War (1939-45). 11,000 conscientious objectors withstood actively participating in violence throughout this particular war. Several of these men are featured in the film and speak about their experiences as they were sent to camps in various Canadian National Park locations and assigned to alternate services. The majority of these people identified as Mennonites, Hutterites, Quakers, and other pacifist groups. For anyone interested in Canadian History related to the WWII, Christianity, and/or Mennonite Heritage, this is a great addition to knowledge on the subject. Throughout the film, stories are told of how the C.O.’s came to be, with the process of their acceptance and activity. Some of the information covered includes the fight for their rights and beliefs, as well as experiences of alternative service. The reality of this is put into perspective by interviewees describing the jobs they were required to fill. For example, these people speak out about the dangerous work conditions they underwent including road work and tree felling, as well as the mentally and emotionally draining aspects such as working in hospitals. These workers express the impacts of difficulties they faced through long hours, with minimal wages earned. Throughout the film, a variety of photographs are shown to supplement the narrative, derived from the events in discussion. The video contains straight forward content that is easily grasped through a conversational approach. The C.O.’s speak of what happened when notified of being drafted, the reasoning behind their decisions, and how they stood by these. Though the topic of the film is heavy, there are no graphic visuals and this can be watched as a family. In reflecting upon the history of WWII, this is an important film to be considered. Credit is often given first to those who fought in the war as soldiers; however, it is important to remember those who served the country in other ways. This film highlights these ideas and remembers the C.O.’s in a positive light. For those interested in more information related to the subject of Conscientious Objectors, the book Alternative Service of Peace edited by A.J. Klassen is available in the MHM bookstore. Wall, Andrew. “The Last Objectors”. Mennonite Heritage Centre Archives. Refuge 31 Films, 2016.